People wey dem suspect say be heardsmen don kill four people for Ngutswen village for Gassol local government area of Taraba State, northeast Nigeria. Dis one dey happen after di governor of di state, Darius Ishaku, bin halla say serious attack go happen for di state. Local media for Nigeria dey carry tori say at least four die for di Tiv village wey di herdsmen attack. Dis latest attack don come sharp-sharp before di 10 days wey di governor bin say attack go happen, after im receive information from di area, say attack wan happen. 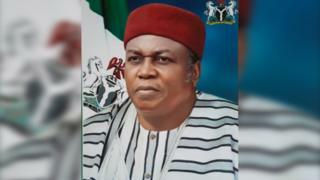 Governor Ishaku bin talk say im don pass di information to security agencies, and im no think say anybodi don take any action. Tori be say di governor dey talk for di capital Jalingo on 1 February, to members of di opposition Peoples Democratic Party, wey come visit am because one member of di state House of Assembly wey be Hosea Ibi, don die. Im say: "when I enter office, I bin ask my people to give me peace, say I go give dem development back. Taraba never take eye see peace, but we get development. I dey here as governor wey wear crown, but I no get sword." "You go call police and security agencies for help; dem go tell you say dem need to clear from Abuja before dem act. Before you know it, you go lose 100 people."